Home HappinessHampi is magical! You must go to Hampi! Hampi. Let me admit this, being a North Indian girl and living in Madhya Pradesh all my life, the first time when I went through the pictures of this region, I found them pretty sober and somewhere close to Mandav. I decided that I would rather travel way past Kerala and visit the tea plantations or maybe take a river cruise. Well, after a lot of thought, I somehow settled my mind for Goa and then to Hampi. Hampi; as I heard from a lot of people is a hippie paradise; an unexpected place with really jagged rocks, rice paddy fields, green hills and palm trees. To an extent, reading this will make you feel like I am talking about just another tourist destination from South India but the moment I jumped out of my 6-hour long KSRTC bus, I was mesmerized. Frankly, it is a paradise nesting carefully in ruins, taking you back to a long forgotten time of the Hindu Vijayanagara Empire in the 14th-century. And right from where I stood and browsed the landscape panoramically, Hampi felt magical. Unfortunately, I had only a couple of days to spend at the place, but if you have a good long week or even more than that, the place will be a bliss to your soul. 1. How to go around Hampi? The city is divided into two major areas by the Tungabhadra river. The southern bank houses most of the UNESCO World Heritage sites. I cannot forget the impressive Viruspaksha Temple that is an ancient temple in the Hampi Bazaar and right adjacent to it is the Sacred fort. I am a bit crazy about exploring the entire place on foot, and so I took my own time, exploring every bit of the remains walking from one end to the other carrying a carefully sketched map by a guide I met at the bus stop. 2. 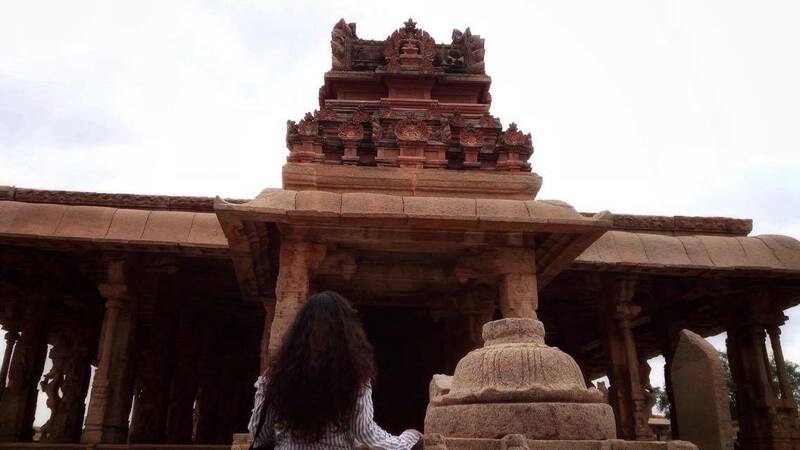 Travel Tips: Taking the Hampi temple trail and trying out authentic and a Rs. 150 chicken thali. After I freshened up and slept a little, my first stop in the city was Sri Venkateshwara Hotel where I met a guide, and he agreed to take me over the whole town. I had a lip-smacking thali there that had Chicken coconut curry, rice curry, curd, chapati, and a bowl full of rice. I was full, not just the tummy but my heart. My day 01 mission was to take the entire temple trail; 3,700 monuments spread over 36 km which frankly are bound to take over a week but because I had the guide with me, it was super easy. The guide brought me to all the known places and told me the stories behind. He even helped me click my pictures and show me spots where I can get good pictures. It was incredible. Plus, all at a price of Rs. 750. For further food and snacks, the guide took me to the local restaurants and eateries, where I had delicious tummy filling grub. The monuments that most impressed me are the Elephant stables and the Lotus Palace; one of its kind, giving you the feeling of a royale. Talking about the Virupaksha Temple, the temple dedicated to Virupaksha, a form of Shiva was the holiest retreat. At the Virupaksha Temple, I was greeted by a couple of monkeys feeding on waste food and water which was a scary sight to take in plus I have a fear of monkeys! Hence, double the fear. On the way into the temple, I heard a symphony, the Puja was being done, and it made me feel sane and meditative. The temple is beautiful. 3. Travel Tips: Watching the sunset. Anyone who is traveling to Hampi should have this one thing on their bucket list for sure. But, where to watch the sunset from? While you might find a lot of spots in the city to sit, meditate and watch the sunset, as far as I traveled in Hampi, I found the Monkey Temple/ Anjana Matha Temple to be the best place to experience the sunset. The temple is outside Hampi. The only twist is, you need to climb 595 steps to reach it but trust me, you will be rewarded for all that pain. The higher you’ll climb, the better view you’ll get. The Anjana Matha Temple at the top of the hill is the temple dedicated to Hanuman, the monkey warrior god. According to the Hindu mythology, he was born to Anjana, and this is the very place. Prepare an itinerary beforehand because there are a lot of places to cover, the ruins sprawl around 30 sq. km. If you are a walkman, go ahead and walk. Every place can possibly be covered walking on foot. You can even hire a bike for only Rs. 30 a day. Their day starts from 7 am. to 9 pm. If going to Hampi, get ready to get a severe suntan. Carry a big hat, an umbrella or even a really good sunscreen. Do not miss going to the Funky Monkey Cafe and Mango Tree. My guide blessed me with this picture. Somewhere around the Lotus Mahal. How did you like the article? Let me know if I missed on anything. Do not forget to follow me on Facebook, Instagram, and Twitter. Also, stay tuned for more posts on the blog. You can now subscribe for email notifications too. Fell in love with this place as soon as I stepped into the rocky terrain. Very well written, very detailed. Hampi is popular for a very rare sport called ‘bouldering’. That’s so good to hear. 🙂 Thank you so much. Hi, just seen a great piece on how to set up your guest manual for you villa rental. Good to see. Thank you so much for such a descriptive and inormative piece.